Today was a wonderful continuation of yesterday’s peacefulness, only it was a thousand times better because I got to wash an elephant. Let me backtrack, because I don’t feel as though I’ve emphasized this enough. When Susannah said she was staying in Bangkok, I opted for Chiang Mai, Thailand’s second largest city nestled in the mighty foothills of rugged mountains and in those mountains (and foothills, really), are elephants. You can bathe elephants in the river. I’ll let that sink in for you. It didn’t take long to sink in for me: Thailand, a muddy river, an elephant happily rolling in the current and me giving it a bath. Like washing a hairy army tank, but cuter. Since then, my sights have been set on one thing: washing an elephant. I have made this goal clear to the universe by excessively verbalizing it to everyone I come in contact with. Susannah grew tired of hearing me say this repeatedly to anyone who entered our office. I took a moment to consider this information. It wasn’t long before I realized I didn’t care if I was wading through pachyderm feces. why would anyone hurt something this lovely?? 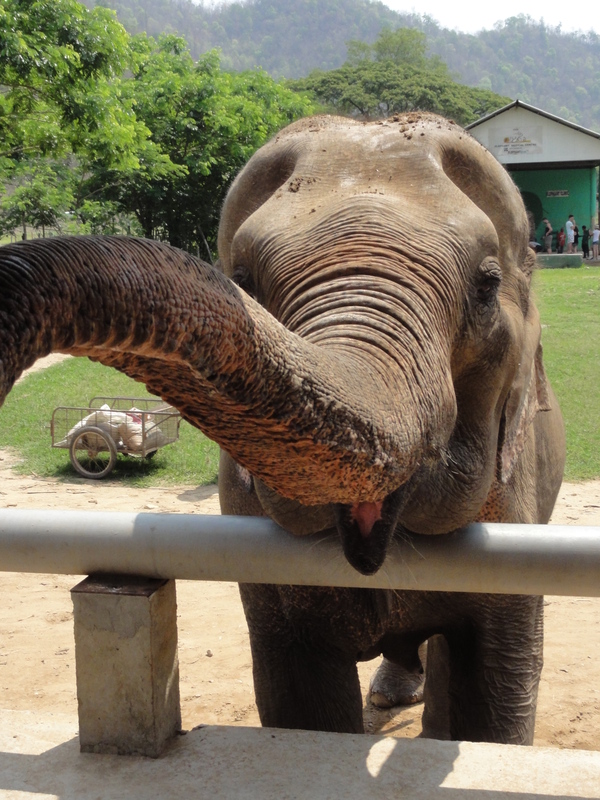 Before leaving, I fired out a few e-mails to various elephant camps in Chiang Mai. Though masked in a pleasant tone, they were borderline obsessive, as I expressed my need for a tour fitting my time frame that involved me washing an elephant. Did I want to watch Mahouts wash elephants? Did I want to maybe take a historic tour of Chiang Mai instead? Did I want to watch elephants play soccer? After running into Chris at the Abu Dhabi airport and gushing about it, I swore that I’d keep my enthusiasm under wraps. So that’s how, at 8:30am, I found myself en route to an elephant camp about an hour or so away from the hostel. I – and the van full of French tourists – watched a documentary featuring a hippie and a plucky girl with plaited hair who wanted to help elephants and make a music video highlighting their plight. The place seemed cool; started in the early ’90s, it sought to create a place for displaced and abused elephants. Elephants had been used for logging work, which was banned in Thailand in the 80s, leaving many of these poor elephants unemployed and unexposed to life in the wild. With no other options, the abandoned elephants wandered among trainers who taught them tricks before putting them in the streets of Thailand to beg. This was a profitable venture, as the elephant beggars could make in one night what the average Thai person makes in a week. At the elephant’s expense, of course. 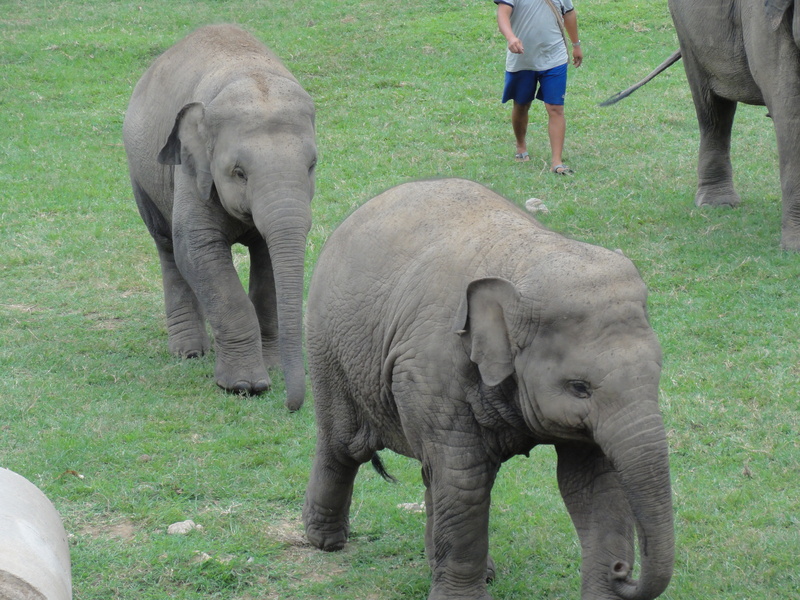 Unlike other elephant camps, the Elephant Nature Park strives to maintain a natural environment for the elephants, hoping that they can one day be released into the wild. This means no soccer games, no paintings, and no carrying gleeful tourists on their backs. I was fine with this, and arrived in high spirits; the sun was high and we were in the foothills, off the beaten track. First, we fed the elephants from massive plastic bins. They easily consumed acorn squash, watermelons, and entire bunches of unpeeled bananas. We could not place our hands in the elephants’ mouths, but we could set the food in their trunks – and damn, were they strong. The smallest trunk swung with all the weight of a tire swing – if your tire came from a tractor. This went on for a good part of the morning. When 1:00 rolled around, I was beside myself with excitement. It was time to wash the elephants. We were each given a bucket and gathered around a long list of elephant safety tips. I expected a verbalized list of rules and precautions, but instead our guide passed around an elephant tooth, apparently as a warning not to get too close. We were quickly herded down to the river, where an overcast sky grew darker overhead. We took off our shoes and waded in over slippery rocks, buckets in hand. The elephants were led in a minute later, and we began dousing them with buckets and buckets of water. 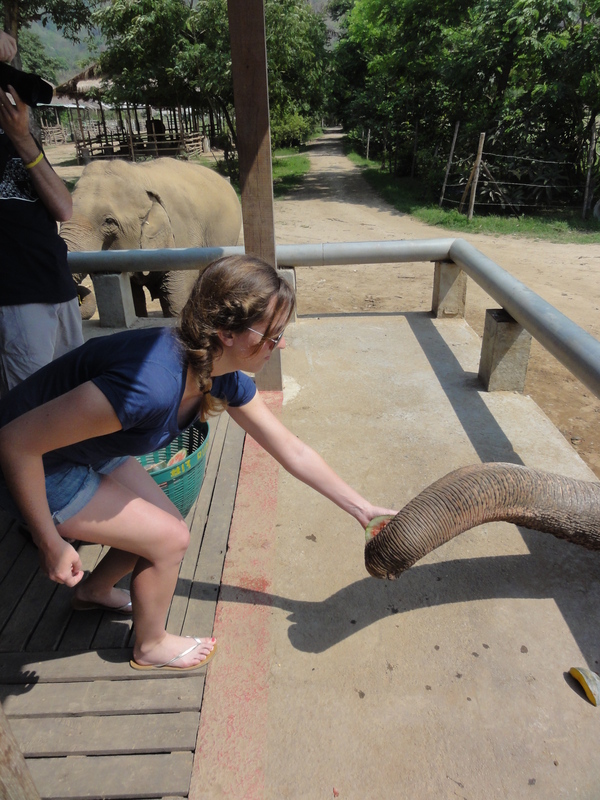 When the mahouts were nearby, we could touch the elephants. I loved every minute of it, despite the pain of sharp rocks beneath my bare feet. washing an elephant in the river. We showered the elephants with water against a backdrop of mountains beneath a cloudy sky. In the distance, somewhere over the mountains, thunder rumbled. It grew louder and closer as we waded out of the river and watched the mahouts lead the elephants back to the camp. I was off to the airport before the rain came, but I wouldn’t have minded it. Wow! Thanks for that – what a compliment! They really are incredible.